Cooke, Troughton & Simms microscopes seem to be held in high regard by their present owners, and two of their models have been described in articles as ‘my favourite microscope’ (ref. 1 and 2). 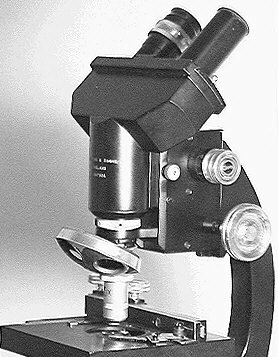 The model that hasn’t been mentioned in this vein to my knowledge is the M2000 stand, but as I was the proud owner of an example, I offer my thoughts on ‘my favourite microscope’ below. The parent British companies of Cooke, Troughton & Simms Ltd (referred to as CTS hereinafter) had a long history, with J. Troughton (senior) setting up a business as an instrument maker in 1756. CTS was formed when T. Cooke & Sons Ltd (controlled by Vickers since 1915) purchased Troughton & Simms Ltd in 1922. CTS was completely taken over by Vickers in 1924, but retained their own name. In 1963 they became part of Vickers Instruments Ltd (ref. 3). Cooke, Troughton & Simms Ltd finally ceased trading in 1988 (ref. 4). Various aspects of the somewhat complex history of CTS, the parent companies and Vickers Instruments are discussed in references 3–6. The hardback catalogues CTS published (e.g. ref. 7) are well worth looking out for on the second-hand market, as they contain a good general discussion of microscopes and their optics, as well as describing and illustrating many of their microscopes and accessories. I was fortunate to pick up a copy a few years ago with the 1946 and 1948 price list in the back, so I could cost my particular model with accessories to the penny (although I am not certain which year my M2000 stand was produced). The catalogue I possess also shows a variety of other instruments including an impressive Vickers Projection Microscope, polishing machines, colorimeters and Blood Diagnostic Apparatus. The serial number on each microscope often incorporates the stand number and if present usually allows the type of stand possessed to be identified. Image left shows the ‘CT&S’ logo often used on their stands, eyepieces and accessories. The serial number indicates it is based on the M2000 stand. I was fortunate to acquire my M2000 stand for a very modest sum when it became a cast-off at work. My model is equipped for phase contrast, and has a set of phase objectives, a bright-field / phase condenser, and a centring telescope. The image right shows some of the main features. It is a moving body tube design with a 160 mm fixed tube length (although see notes on the fine focus below). It is finished in a satin black enamel with chromed controls, and although not a large stand (at 35 cm high), it is heavy (ca. 6 Kg) and very stable. The body tube with inclined binocular head is on a sliding brass dovetail, which can be removed and replaced with a vertical monocular head (which I also possess). Each head is held in place by a knurled screw on the left of the stand near the fine focus. The large coarse focusing and condenser knobs allow easy manipulation of the controls. This model has the M1336 mechanical stage with vertical adjustments, which is probably not as convenient as the alternative M1341 stage illustrated in the catalogue with horizontal side mounted controls. The feature most CTS microscope owners comment on is the fine focus, and the author is no different in this respect… the fine focus is superb. CTS in their catalogue succinctly describe the focus as follows. 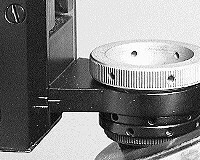 The fine focus only acts on the objective changer and nose (see image right), thus the mechanism is not overloaded by the weight of the binocular head. One division on the graduated focus knob corresponds to a 2 µm vertical movement. The movement is limited by stops to 1 mm each way and shown on the stand by limit lines. CTS state that the slight change in the tube length when fine focusing is not sufficient to affect optical performance. The motion is so lightly loaded that accidental contact of the objective and slide is not sufficient to damage the slide. 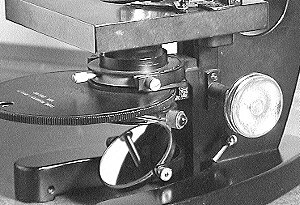 This type of fine focus was also used in the M3000, M4000 and the more advanced polarising stands of the M7000 series, but not in the M1000 and simpler M7000 stands, which used a conventional fine focus with bell lever crank. Images left and right show the internal mechanism of the fine focus as illustrated in the catalogue. The grey shaded areas are those parts which move on manipulation of the fine focusing. The coarse focus is the traditional brass dovetail construction with rack and pinion gears, with the rack teeth cut obliquely. After ca. 40+ years both the coarse and fine focus are very precise with no slack. The condenser substage is also rack and pinion, with a cylindrical (38.6 mm diameter) simple clamp fitting for the condenser. The phase condenser supplied (an Abbe condenser N.A. 1.0) is non-centring, although the phase rings selectable on a rotating disc are of course centrable. A useful feature is that the plano-convex mirror can be clamped on two axes to avoid knocking, whereas on my Russian Biolam microscope it is easy to knock the mirror when changing filters. When I obtained the microscope it had 20× (N.A. 0.45), 45× (oil, N.A. 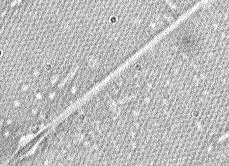 0.95) and 95× (oil, N.A. 1.3) achromatic phase objectives. There was a 10× phase ring on the condenser, and I had spent some years waiting for a 10× CTS phase objective to turn up on the second-hand market. My patience was recently rewarded, and I was able to purchase one for less than £10 to complete the set. The objectives are shown right, and although the 10× (N.A. 0.28) objective is slightly newer in style to the original series it is close enough! The coloured bands were not used by CTS to specifically indicate phase objectives, but as they state “the colours have been arranged in order of the spectrum, so that the colours representing the various powers may be more easily memorised”. The fluorite objective was in addition marked with a black band to aid recognition. CTS also marketed a range of other objectives, including apochromatics and objectives for dark ground illumination of opaque objects. 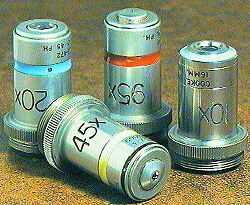 The objectives are complemented by a pair of 8× and 12× compensating eyepieces. I’m not in a position to comment on the quality of the optics compared with other manufacturers of this era, but to me the 45× (oil, N.A. 0.95) fluorite phase objective in particular is a real delight. It was a revelation when I first looked at the classic diatom test slide Pleurosigma angulatum with this objective using bright field. The dots were very clearly resolved, whereas although the Russian 40× achromatic objective (dry, N.A. 0.65) on my Biolam stand can resolve them, it requires contrast enhancement such as oblique illumination to see the dots convincingly. I don’t regard the M2000 as an elegant stand, but more as a good example of quality optics and engineering in an era before the rapid decline in British microscope manufacture. (As an aside, my vote for an elegant microscope would probably go to the Wild M20, Zeiss Universal 1 or the current Zeiss Standard KF2 student stand.) The CTS microscope I have, has to my knowledge never been stripped down and serviced, yet the mechanical and optical components are still in sound condition, although showing some wear and tear after 40+ years. Like many microscopes of this era and earlier, they still have a lot of life in them, and more importantly give great pleasure to the amateurs like myself who regularly use them. Comments to the author Dave Walker welcomed. Images digitally captured direct to the PC via a Panasonic CL350 colour CCD camera (430 horizontal line resolution) fitted with Nikon SLR lenses (via adaptor) and using a Creative Labs Videospigot capture card. Image processing using Photostyler 2.0. Apart from the diagrams of the fine focus mechanism, microscope images were video stills of my microscope, not scans from the catalogue.